Preheat oven to 375 degrees F. Line a 9x13-inch baking dish with foil, allowing the excess to hang over the sides of the pan. Spray the foil with non-stick cooking spray. In a large bowl, stir together the granola, ¼ cup of the flour and the salt. In a medium bowl, whisk together the egg whites, maple syrup and oil until foamy; pour over the granola mixture and stir to coat. Place three-quarters of the granola mixture in the prepared baking dish and press it into the pan, forming an even layer. Bake for 15 minutes. Meanwhile, place the peaches, sugar, ginger and cinnamon in a small saucepan over medium-high heat. Cook for 8 to 10 minutes, stirring, until the peaches are tender; remove from heat and stir in the 2 tablespoons of remaining flour. 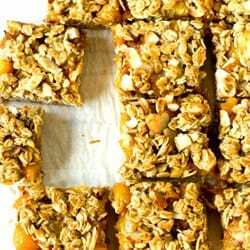 Spread the cooked peach mixture over the baked granola bar base. Add the sliced almonds to the bowl with the remaining granola mixture and toss together; spread evenly over the cooked peach layer. Bake for an additional 20-22 minutes, or until the bars are golden brown. Remove from the oven and cool completely on a wire rack. Cut into bars and serve. Leftovers can be stored in an airtight container at room temperature or in the refrigerator (I enjoyed these cold! ).